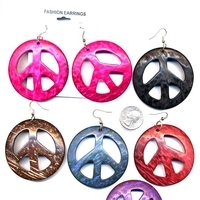 $18/DZ EARRINGS, PEACE SIGN, NATURAL COCONUT SHELL PAINTED 6 GREAT COLORS. HAS NATURAL CURVATURE THE EARRING, LARGE ALMOST 2.5 " DIAMETER. LOOKS REALLY GOOD.